Graphic silk evening dress (1970-73) by Thea Porter. I love this time of year. Yes, it is cold outside. Yes, it is dark early. But ... the fashion week takes places around the world and I so enjoy reviewing the collections and pinning my favorite dresses as they are always my favorite aspect of each show. The little white dress is an icon in the fashion industry. Interestingly, this year's collections have a long white dress as a staple. Below, you can see examples by Victoria Beckham, Rachel Zoe, and Brock. Same idea, very different results. 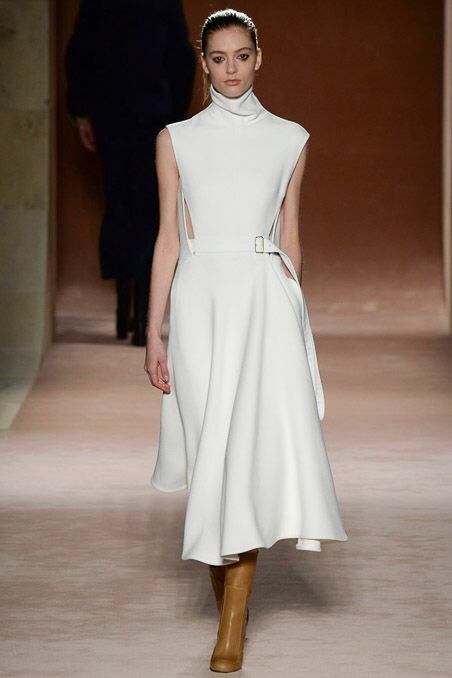 Beckham's interpretation is modern and I can see an urban professional woman wearing this dress to a meeting. Sharp, clean. Zoe's dress is minimalist - the strong shoulder makes it modern, the long silhouette and flare at the bottom give it a touch of romanticism. It would pass for a beautiful evening gown. Brock, finally, gives us the most romantic version of these. The top seems to a be a classic short dress; the bottom is a oversized skirt. It must move beautifully. I like to this of fashion being for all people - no matter what your taste is, there is a dress for you. And this year's collections indeed have a lovely selection. Which one would you wear? Mobile kitchen. Jamaica. January, 2014. 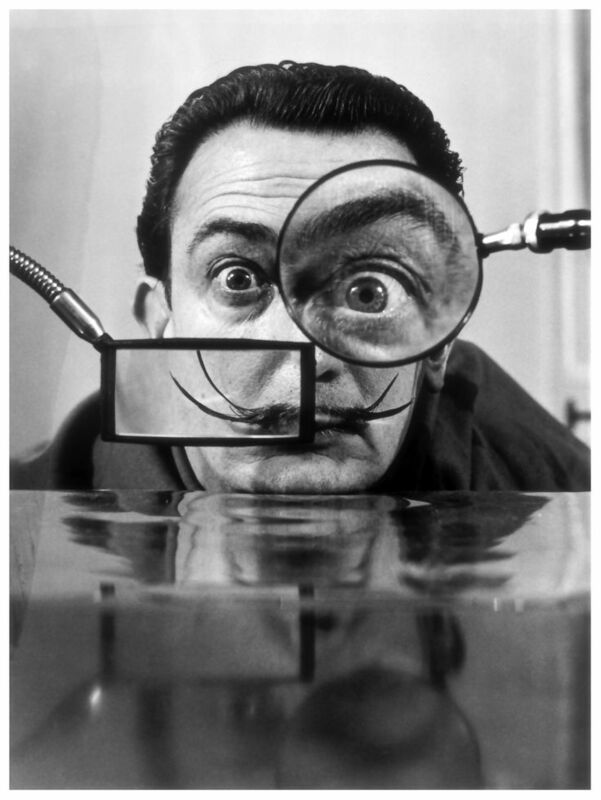 Fashion designer Elsa Schiaparelli struck a friendship with Salvador Dali, the famous artist. They collaborated professionally and their unlimited creativity led to several wonderfully eccentric articles of clothing. Let's take a look! 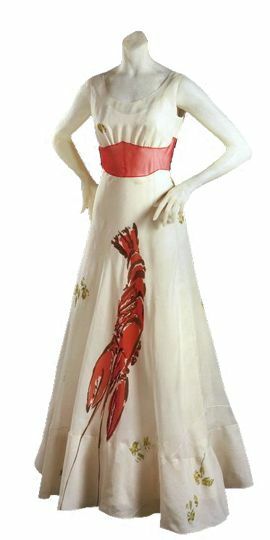 Lobster dress ... Schiaparelli designed this lovely red/white dress. "Dali placed the lobster amid parsley sprigs on the front of the skirt (and apparently was disappointed when Schiaparelli would not allow him to spread real mayonnaise on the finished gown), and master silk designer Sache translated the sketch to the fabric." Tear dress ... This is a masterpiece of illusion. "Tears' print was specially designed by Dali. some of his Surrealist paintings showed figures in ripped skin-tight clothing, disturbingly suggestive of flayed flesh. 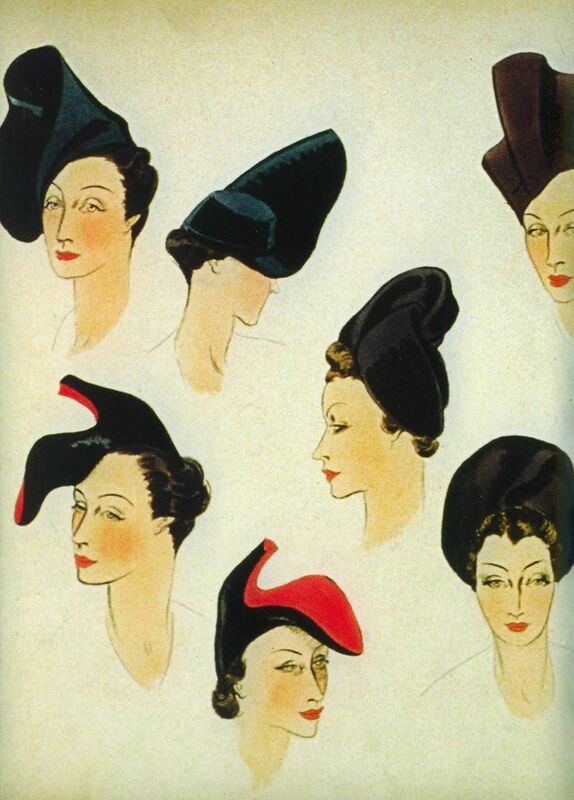 Schiaparelli owned one of these pictures." Shoe hat ... Finally, the collaboration of these two geniuses resulted in the creation of the shoe hat! The drawings and this hat were on show at "Killer Heels" at the Brooklyn Museum. 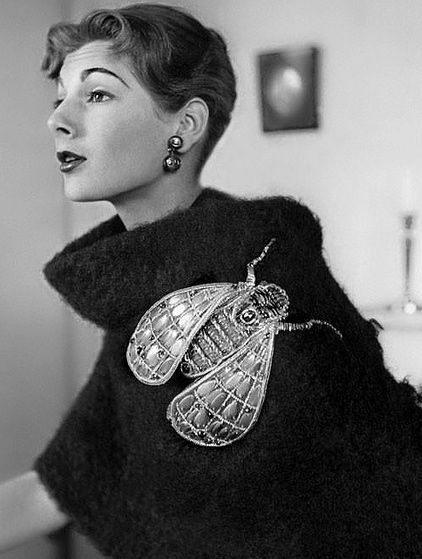 Dali come up with the idea; Schiaparelli executed it. I can only see the shock of Schiaparelli's and Dali's contemporaries when these items were shown to the public. Both of them were so ahead of the times - with their creativity, humor, and unconventional passion for life. Traveling means magic. It means that you will arrive at places you always wanted to see. It means you will arrive at places you never knew existed. And traveling means magic because it changes your life. I have been very fortunate to travel freely and often. My travel bucket list does not seem to get any shorter though ... I keep adding places. I bet it is the same for most of you. One of the most magical places I recently visited is Tikal National Park in Guatemala. I went there on a day trip in January 2015 and it took my breath away. Imagine walking through the jungle being surrounded by lush greenery. The path is closed up with branches and vines. Then, suddenly, a clearing opens up in front of you and there is a Mayan temple right in front of you. And while the Mayan ruins lost their colors (yes, the pyramids and temple were indeed painted over with vivid colors), they did not lose their grandeur! - Tikal National Park encompasses 575 square kilometres of jungle and thousands of ruined structures. - The central part of the city alone contains 3,000 buildings and covers about 16 square kilometers. - Archeologists estimate that the Maya settled in the area in about 900 BC. Isn't this amazing? To be surrounded by such impressive feat of humanity? The Mayan culture is fascinating. History.com provides a nice summary: "The Maya Empire, centered in the tropical lowlands of what is now Guatemala, reached the peak of its power and influence around the sixth century A.D. The Maya excelled at agriculture, pottery, hieroglyph writing, calendar-making and mathematics, and left behind an astonishing amount of impressive architecture and symbolic artwork. Most of the great stone cities of the Maya were abandoned by A.D. 900, however, and since the 19th century scholars have debated what might have caused this dramatic decline." So, enjoy the photos in this travel blog - I took them during my lovely visit to Tikal. I hope they convey my amazement of this place and my respect for the achievements of the Mayans. I will never forget climbing a temple, feeling out of breath yet so full of life as peaks of pyramids stood above the jungle. I will never forget the murmur of other visitors, of their amazement and wonder. Do you have a place that took your breath away? Forest, mountains, and the sky. Jamaica. January, 2013. Reading about fashion history is one of my favorite activities on a free afternoon. The National Museum of American History in Washington D.C. has a section called First Ladies' Fashion, which if you are a history buff or enjoy fashion, is definitely worth seeing. The collection is important as it has, in addition to a fashion collection, more than 1,000 objects. All of these items document the lives and contributions of first ladies. While a first lady is often remembered for her style, this collection highlights social and political activities - the exhibition explores the stories of these women throughout history. Take a look at the two gowns below. They say so much about history and how fashion changed. Mary Lincoln enjoyed a silk dress. The times required a modest look - her shoulders and arms were to be covered. The gown's silhouette suggest that a beautiful body was defined by a small waist with the hips area being accentuated by a voluminous skirt. A hundred years later, Jacqueline Kennedy attended an event wearing a one-shoulder gown. Her arms were fully exposed. The silhouette is body-hugging. If you have a chance, spend a couple of hours browsing the Museum and enjoy this exhibition. You will learn a lot about history and how fashion has changed over time. You will be able to imagine how these women lived their lives, what they wore, and how they affected the society through their social and political work. Callot Soeurs dress of black silk with bands of gold lamé. 1924. On a recent trip to Belize (read more here and here), I was overwhelmed by the beauty of the country but also by the indefinite number of colors and textures. And I put my camera to work to capture all of this magic! It is indeed true that we are deeply altered by the places we live at (or that we visit on our travels). The Belizean people are friendly and almost always had something to laugh about. Their lives are indeed enriched by the natural treasures of their country. And as my fashion designer eye never sleeps, the photos below show you several wonderful textures and colors I came across on my walks. Look at the intense (almost neon-like) color of a palm tree leaf! And the variety of greys and browns in a pile of banana tree seeds! The local have a long history of wonderful patterns and rich colors in their fabrics. Here are two examples - photos I took at a local market - of their wonderful sense for color combinations. The fabrics are handmade and truly transmit the workmanship and the creativity of their creators. Have you gone to a place that charmed you with its colors and how these have been incorporated into local products? A watercolor illustration by Swedish fashion illustrator Cassandra Rhodin. New life on a fallen tree trunk. Seneca Creek State Park, Maryland. December, 2014. My fashion design philosophy is simple. I enjoy designing for women who look for straightforward uncomplicated fashion with a special detail. They want garments that stand out because of their workmanship and design elements. I focus on dresses as I like how comfortable and versatile they are! You have already seen many examples of my work. I like sewing patterns and prints. I like to alter these through the use of gathers, pleats, and cutouts. I like investigating volume and playing with various silhouettes. Here is an example of a dress that stands out because of sculptural elements I added. While the fabric is lovely on its own - a very subtle animal print in shiny silver - the main draw are pleats on the front and in the back and in the sleeves. The pattern for this dress is simple - it is a sheath with front and back darts to shape it around the waist. I, however, cut up the pattern and opened up the top and back and inserted 3" box pleats. When I cut out the fabric and sewn it into shape, I increased the volume and visual interest. The pleats close and open as I move. They are subtle but still interesting. My favorite aspect of this dress are its sleeves. As with the top and back, I opened up the pattern and inserted pleats. These pleats sit comfortably on the art while adding a visual interest. As with my other designs, I look for versatility. I like to dress the garments up; I like to dress them down. I recently wore this dress with blue tights and black boots. In the summer, I may wear color heels to spruce up the silver sheen. As I said earlier, dresses are my passion and this one is quickly becoming one of my favorites! If you wish to order a skirt or a dress, contact me!